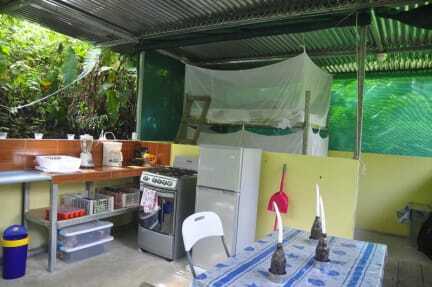 Utopia Tica Sustainable Lodge i Puerto Jimenez, Costa Rica: Reservér nu! At Utopia tica Organic Farm and Hostel is an original hostel in Puerto Jimenez.The sanitary consists in three showers in a “banana-circe” (the banana-cirle enables us to use again the water of the shower into the fruit trees around it, therefore we kindly ask guests to bring biodegradable products). Three dry(compost)toilets feeds a compost which itself feeds the fruit trees. Slow internet is provided compensated with family dinners, card games and bonfires. Utopia tica Organic Farm and Hostel is a charming and rustic hostel as well as a food forest (under construction) nested in the heart of the Osa Peninsula, more precisely 200 meters from the entrance to the “el tigre” trail which is one of the four entrances to the world-famous Corcovado national park. It is said to be the most intense biodiverse place on earth. 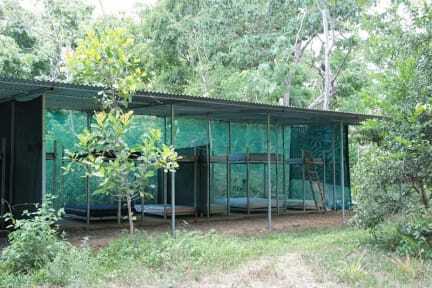 The utopia is located in the small village of Dos Brazos de Rio Tigre, 14 km from Puerto Jimenez. The hostel is composed of three rooms which each include six beds and a terrace with hammock, bench and table. There is also one kitchen equipped with fridge and oven. Free coffee and tea.